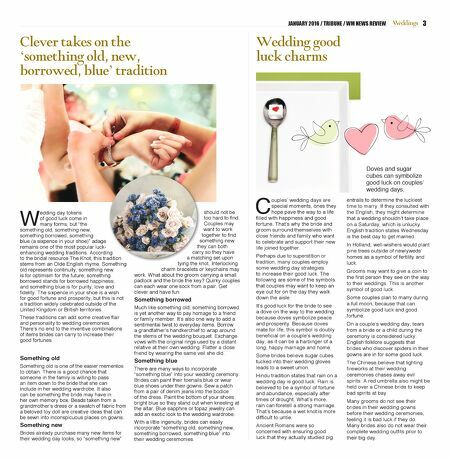 2 JANUARY 2016 / TRIBUNE / WM NEWS REVIEW C ouples looking to customize their wedding with a personal touch don't have to look much farther than Grand Haven's Centertown. At Studio JSD, couples can make their own wedding bands through the Wedding Band Workshop. From selecting the met- al to making the ring, couples experience the process of making rings to symbolize their love. Couples meet with Julie Sanford, owner of Studio JSD, 219 N. Seventh Street, Suite 4, in Grand Haven, to discuss the type of metal and weight they want out of a ring, the style and from where they are going to resource the metal. The Wedding Band Workshops cost $75 an hour plus materials. Depending on the couple, it takes be- tween four and six hours to make the ring, Sandford said. The local workshop started after Sanford's colleague offered one in California. Sanford said she thought it was neat to share with couples. Former Muskegon resident Daisha Cassel and her husband, Matt Smith, turned to the local workshop for Smith's wedding band. Cassel already had an antique band, and the couple searched jewelry stores look- ing for something unique. Whether it's repurposing old metal or oth- er metal that Sanford helps them obtain, couples melt the metal in a pot called a crucible, with the help of a torch. Couples pour the hot metal into a rod. From there, they can shape the metal with a hammer, depending on the type of finish they want. Within one day, Cassel turned her 1980s herringbone necklace into her husband's wedding band. It took Cassel between five and six hours, which included making a practice ring to ensure she had learned the techniques and tools. Cassel said she was surprised she could learn everything and make the ring in one day. "It was a lot of fun," she said. Although it's been five years since Smith and Cassel were married, Cassel said her husband still receives comments about his ring. When couples come from out of town and plan to spend a few days in West Michigan, Sanford said she recommends hotels and places for them to visit while they're in town. Though couples walk way from their rings at the end of the day, Sanford said it isn't necessarily about the jewelry. "It's more of an experience," Sanford said. Couples interested in scheduling an appointment or learning more can call 616-607-2470. For more information, visit www.theweddingbandexperience.com. 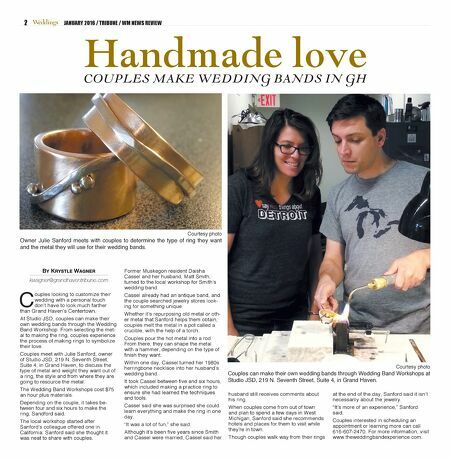 Handmade love COUPLES MAKE WEDDING BANDS IN GH Courtesy photo Couples can make their own wedding bands through Wedding Band Workshops at Studio JSD, 219 N. Seventh Street, Suite 4, in Grand Haven. BY KRYSTLE WAGNER kwagner@grandhaventribune.com Courtesy photo Owner Julie Sanford meets with couples to determine the type of ring they want and the metal they will use for their wedding bands.